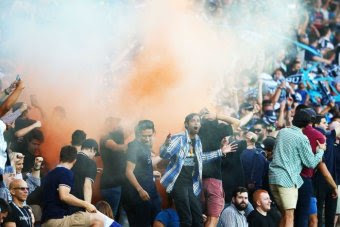 Melbourne Victory have accepted sanctions of a $50,000 fine and a suspended three-point deduction, and vowed to tighten security to prevent a repeat of Saturday's flare-fuelled chaos at its A-League matches. The sanctions, handed down by Football Federation Australia (FFA) on Wednesday, followed flares being let off by Melbourne Victory supporters inside and outside AAMI Park during the match against Melbourne City. The punishment was identical to that dished out to the Western Sydney Wanderers a week earlier after their fans ripped flares and created havoc at Docklands in their match against Melbourne Victory. In handing down its sanctions against Victory the FFA said poor behaviour by some club supporters also included "an alleged assault on TV news personnel outside the stadium, throwing missiles at a Melbourne City player and a Victoria Police officer, and altercations with police after the match". FFA chief executive David Gallop described the behaviour of a number of Melbourne Victory supporters as "deplorable". "It's staggering that these dangerous incidents happened just days after FFA had applied sanctions to the Western Sydney Wanderers because of the actions of some fans," Gallop said. "The focus on fan behaviour could not have been more acute." Gallop said he had been encouraged by the response of coaches and executives of both clubs to condemn the poor behaviour. "They are saying 'enough is enough' and as leaders and ambassadors of their clubs they want to be part of the solution," he said. The deduction of three competition points from Melbourne Victory will be triggered by the FFA should any serious incidents be committed by the club and its supporters in or around any matches it participates in during the next 12 months. Melbourne Victory's submission was taken into account in the determination of sanctions by the FFA. Victory chief executive Ian Robson said although the club is disappointed to be in this situation it will not appeal the sanctions. "We came to a decision very quickly not to appeal," Robson said. "We felt it was important to move quickly to resolve this matter before Friday." A-League fans say they are fed up with some members of the crowd lighting flares and giving the game a rotten reputation. Victory host Adelaide United at AAMI Park on Friday night and Robson said the club will have increased security at the ground. "If it takes fans extra time to enter the venue, it is a small price to pay." Chairman Anthony Di Petro said the club must unite to rid itself of the unsavoury element that presented itself during the match against Melbourne City. "The message has got through," Di Petro said. "We have 27,000 members who love this club. It's a marginal element that we're dealing with. "Let's not find ourselves in a position where we are debating whether points should be taken or not. Let's stick together." Victory coach Kevin Muscat joined the pleas for the unwanted behaviour to stop. "I'm deflated, the behaviour is illegal," Muscat said. "The live atmosphere at a Victory game is unrivalled, but the anti-social behaviour must stop."